It has been a great holiday weekend thus far. 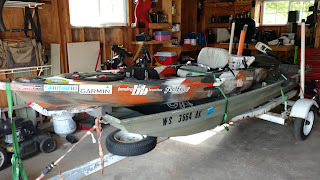 My family surprised me with an early Fathers Day/birthday present which included Keen Uneek sandals for kayaking, some lures, and a Garmin VIRB XE (check out my YouTube channel for upcoming videos). Yesterday I spent the day fatbiking with a family member. I was also honored to have Garmin publish one of my past articles. 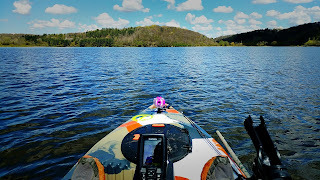 As the month wraps up, I was eager to hit my local reservoir in hopes to claim a higher position on the May Kayak Bass Fishing North Central Great Lakes tournament hosted by TourneyX. When arriving at my local reservoir before sunrise, I notice the heavy fog. Visibility is nearly zero. After performing my unloading/rigging ritual I hit the water. The fog is so dense I turn on my 360 light for safety. With visibility so poor, I cannot see shore. 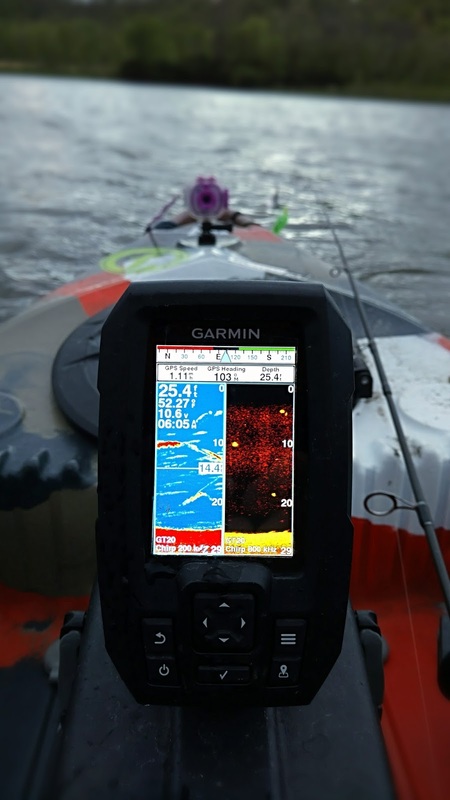 I use my Garmin Striker 4's GPS to navigate to the first location I plan to fish. Upon arrival, I toss my go-to lures: hollow body frog and buzz bait. Nothing is interested in my offerings. I continue to work the shallows, points, and ledges without success. I am meeting someone I met on my Instagram account who was in the area. He arrives and I learn he is a fellow Team Ardent member. We continue working the area without success and decide to change things up. We move to the rip-rap along the dam. Shortly after arriving, we notice the bass have moved shallow, near the rocks. While retrieving a snag, I nearly hit a large bass near shore. Being new to kayak fishing, I am not used to sneaking up on fish like this. My heart races and I force myself to calm down. This is an 18"+ fish. 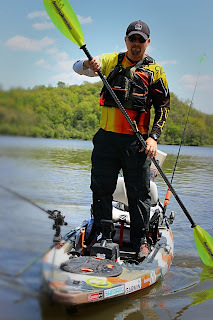 I pull my baitcaster out of the rod holder on my FeelFree Lure like a samurai warrior draws his sword. A hollow-body frog being my go-to, I try it first. The sow is not interested. Oddly enough, she does not spook and is swimming a pattern near the cattails I'm resting against. She inquisitively approaches the front of my kayak. I spot a large cloud of fry. She is guarding the fry and will not leave the patrol. In this moment I realize this will be a challenge and an opportunity. I think to myself, WWCHD (What Would Chad Hoover Do)? If you are not familiar with Chad, he is the found of KBF. 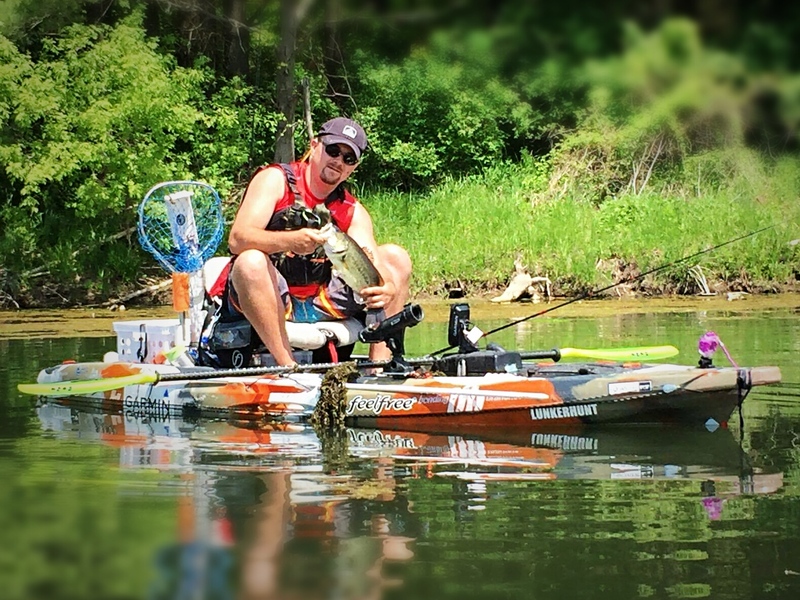 I'd say he is the Chuck Norris of kayak fishing. I watch his various kayak fishing shows. I have watched him stalk female bass on his YouTube channel. He preaches patience. I am not a patient person, but I can try. First I toss a wacky rigged senko, as I already have one on my spinning setup. She isn't interested. I'm feet from her, standing in my kayak, working her patrol area. The worm is not a threat to her fry, and she knows it. I swap it out for a craw plastic. Also not of interest to her (though she looked at it briefly). The smaller buck has come up a few times to check things out but leaves. My fishing partner and I work the area, she isn't interested. He spots other bass also patrolling nearby fry and waiting for food to come down the ledge of the dam. I tie on a brush-hog style plastic and start slow-rolling it over her patrol area. I see the lure nearing my kayak and she attacks! This reservoir is usually very stained from the runoff provided by Wisconsin farmland. The fish, and I, are accustomed to this reduced visibility. 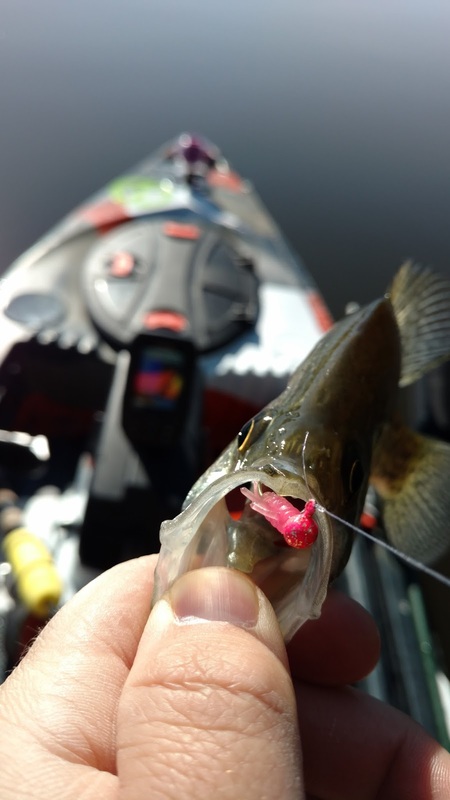 This has caused a challenging start to the bass season for me, as the bass are reacting to different lures and presentations differently. In this situation, I am able to see the hawg hit my lure. Excited, I set the hook just as she grabs it. I miss the hookset and tug the lure out of her mouth. After yelling a few choice words, I know she has officially lost interest in this peculiar creature. I spend the next 30 minutes working the patrol area with predatory-looking plastics and other lures. The deck of my kayak looks like a clearance bin at Cabela's. Plastics, bags, and other lures are scattered everywhere. After tossing everything we can think of, we admit defeat and decide to try frogging in the thicker mats on the other side of the lake. En route to the mats, we stop because we notice fish jumping in a patch of vegetation. After a few casts and closer inspection, we find it to be large carp and carry on with our paddle. We stop again near a brush pile we found to hold bass. We see at least 6 large bass. We again try swimbaits, frogs, etc. with no success. We are sitting atop of them and they don't care about our kayaks or the lures presented. Continuing with our original plan, we move to the mats. 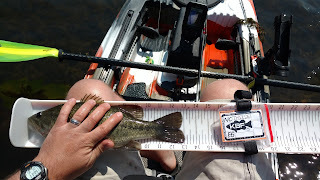 My fishing partner catches a bass with a hollowed bodied frog, but it is a small one. The bay is very active, but nothing is biting. With family plans for this Memorial Day afternoon, we decide to call it a day. 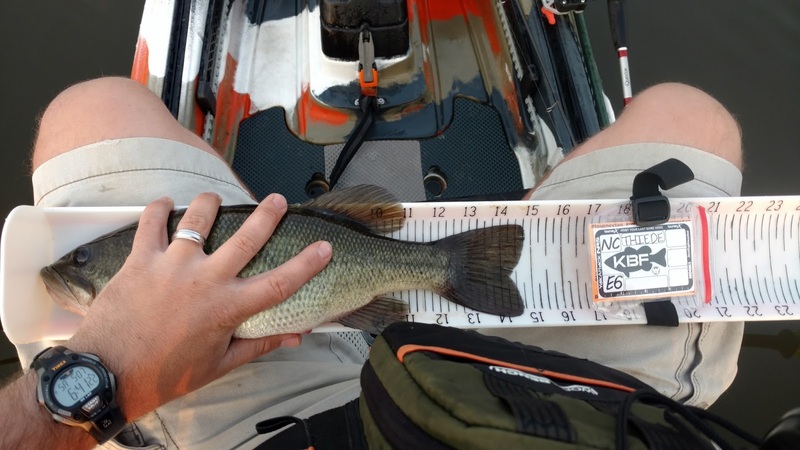 Like this entire last week of fishing, we spotted more large bass than we can shake a stick at. Unfortunately, only the small ones are biting. The Wisconsin spring was tough on them. Once the waters reached spawning temperatures, we hit another cold snap and temperatures plummeted. The odd spring has created fish patterns like I've never seen before on my home water. At this point, these monsters are taunting us. I think it is time to let the bass rest and protect future bucketmouths while I enjoy the afternoon with my family and remember those who gave the ultimate sacrifice so I can enjoy future days on the water. The end-of-May is near. Children are looking forward to their last day of school, high school and college seniors are celebrating graduations, and we are looking forward to Memorial Day weekend. This weekend, the kickoff to summer, is spent enjoying various activities while remembering the service members who died to protect our freedom. For me, the end of May marks the end of my first fishing tournament, the push to crawl up the leader board. I started out strong in the KBF North Central Great Lakes tournament. I had a successful Wisconsin bass opener that put me near the top of the leader board. As the month has gone on, I have moved down/up/down on the leader board, which I love. TourneyX's real-time tournament management is a great catalyst for a lively competition. Holding at 7th place, determined to move up on the board, I left my FeelFree Lure and tackle loaded. I was poised to hit the water after my day job. Last night the stars aligned and I was able to hit the water last night. But a couple hours before my departure for the lake, I received great news. I was accepted onto the pro-staff team at Ardent Reels. I was honored to be accepted to this team. I am a fan of companies that stand behind their product. Ardent stands behind their product with an amazing 3 year warranty. I am proud to represent a company who takes pride in their product. This news made me even more eager to hit the water. I roll my FeelFree Lure down the ramp, happy to see glass-like water. My Bending Branches Angler Pro slices through the water, propelling me to my first destination. 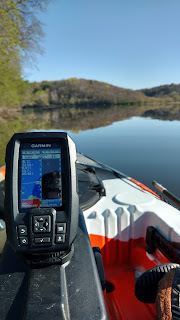 My Garmin Striker 4DV shows water temperature in the low 70s. The weed mats are growing, my favorite kind of weather, frog weather. I eagerly hit the first mat, next to a ledge. Call me crazy, but the clear water has me disappointed. This reservoir is typically stained, and fish are most active in stained water. Unfortunately, recent rains were not enough to wash cow manure from surrounding farmland into the water. As I stand and sight fish, I spot small bass, countless bluegill, and minnows. After a few tosses of the frog and buzzbait, I decide to move onto another mat. This mat sits between a steep ledge and spawning bay. A perfect spot for frogging. I work the mat, switching between a Ribbit and Lunkerhunt frog. Typically alternating the two every few casts results in a few blowup holes within a few minutes. Tonight, that is not the case. I finally have a taker. 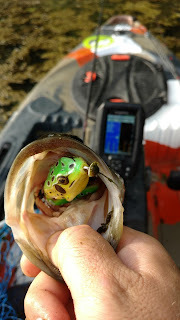 Other than the blowups, one of the joys of frog fishing is the surprise. It is like opening a present. The gift is the fish and the wrapping paper a large clump of aquatic plants. I eagerly pull away the sticky muck hopeful the gift inside will move me up in the leader board. To my disappointment, the bass is slightly smaller than my current smallest fish. I still take a moment to enjoy the fish. Though it is barely a "keeper" by Wisconsin regulations, it still has nice coloring and girth. After working the mat a while longer with no success, I move to another bay. Daylight is fading and I decided to move away from the mat approach and try for brush. I alternate between a jerk bait and Ribbit frog. Since the water is abnormally clear, I'm able to stand and sight fish. I spot two large bass patrolling an area on the edge of the brush. Neither are interested in frogs, so I throw on a senko. I slowly work it around their territory. They show interest, one even gives it a taste, but they are ultimately not impressed. Eventually both swim off into the depths, annoyed by the barrage of plastics tossed their way. 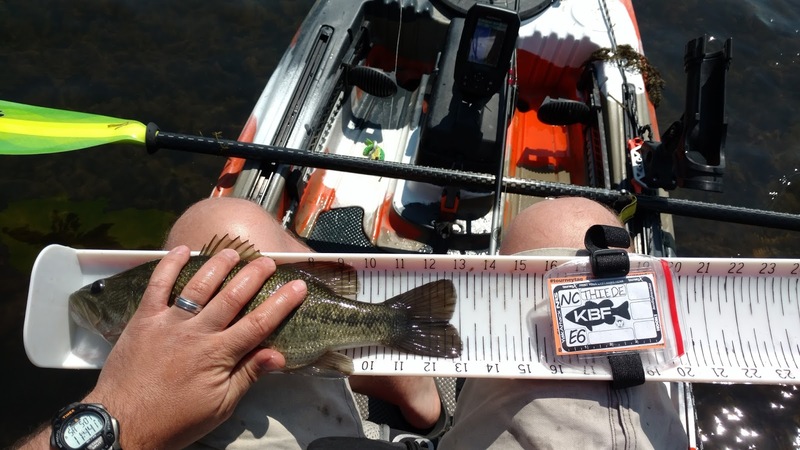 Fishing from a kayak has brought me an entirely new experience to fishing. I love the lack of reliance on a motor, a battery, or a fuel tank. I'm able to fish waters even my jon boat cannot reach. I am also able to stealthily approach bass I would not otherwise see. Last night I was less than 2 feet away from the circling largemouth and did not spook them. I am going to spend the weekend enjoying various activities. I have joined the June North Central Great Lakes Tournament. With the backing of the great folks at Ardent Reels, I'm excited for things to come. I wish everyone a safe and happy Memorial Day weekend. Please take a moment to remember the reason for the holiday, our fallen soldiers. Saturday was a long, but beautiful, day on the water. After many miles of paddling, and towing a boat with my kayak, I was sore. 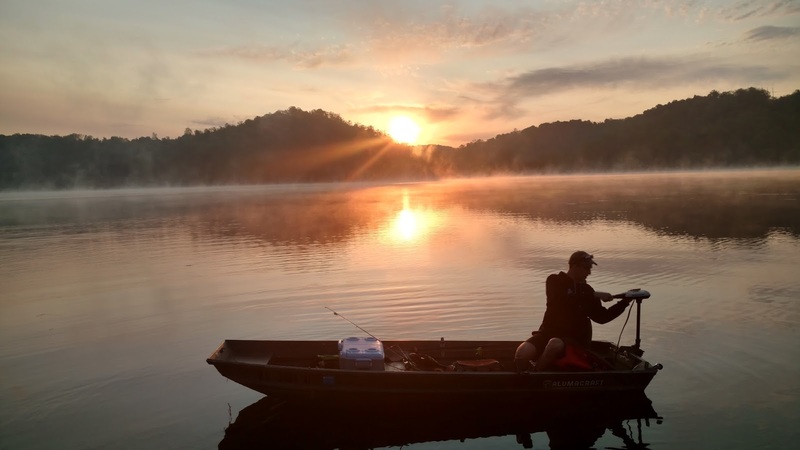 My surprise fishing partner and I had every intention of waking up earlier to get on the water earlier the next day. After a nice night hanging out with our neighborhood friends Saturday night, I hit the bed and quickly fell into dreams of catching more bass. Frog season is officially in full swing with the Wisconsin temperatures staying steady. After going to bed too late, my alarm woke me at 4:30 AM on Sunday as planned. I immediately notice a significant soreness in my upper body. I dismount the bed with the grace of a newborn giraffe and stumble to the living room. My fishing partner isn't up yet. I spend a few minutes checking my blogs social media accounts then fall asleep in the recliner. Awaking a few minutes later, I take it as a sign that this was not my fishing day. After a restful sleep, I awake to my family and learn my fishing partner was up an hour later. He too opted to return to his slumber after he found I did the same. I spent the morning with my family. We went out to breakfast and ran some errands. Itching to regain my position in the KBF regional challenge hosted by TourneyX, I ask my wife about our plans for the day. To my delight the plans allowed for me to get in a few hours of solo fishing. I load up my FeelFree Lure and head to my local reservoir. I immediately head to the location that produced several bass via frog the previous day. The temperatures are still beautiful and the sky blue. However, Saturday's non-existent wind has decided to make up for lost time. It is blowing 10-20. Luckily I was fishing shallow and my stakeout pole was able to keep me planted. A few casts in and I get several promising hits on the frog. The bites quickly stop as I move deeper into the spawning pocket. I try to switch frog styles/covers with no difference. They are still biting in the same area, but aren't fully committing. After a couple of frustrating hours of working the mats without success, I decide to call it a day. The excessive wind has compressed the weed mats against the shore. The bass can't seem to get through it well enough for a hook up. Nor do they seem interested in making additional effort or hitting in the holes I stop my frog in. After taking a moment to enjoy the view of the otherwise beautiful day, I think of my family at home. This is a perfect afternoon to spend time with them outdoors. I drop the seat on my kayak and paddle ashore. 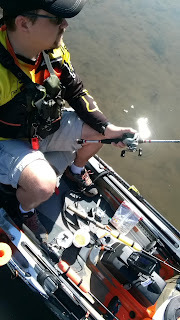 As I pull my kayak off the water, I answer the usual inquiries about my FeelFree Lure, Garmin Striker 4DV, and Bending Branches Angler Pro setup. I provide the inquirer's Austin Kayak's information to order it, allow them to take a picture, and load my kayak. Upon arriving home, much to my delight, my family is outside. The neighbors have gathered for another fun social gathering and the neighborhood kids participated in an epic water gun fight. I let my urge to hunt for largemouth and climb the tournament rankings neglect my usual planning. The high winds, high heat, heavy fishing pressure from the prior day, and short fishing window were not ideal. Don't get me wrong, any time on the water is beautiful. However, sometimes you need to know when to fold 'em and spend time with friends and family. The great KBF/TourneyX format gives me the rest of the month to climb the leader board. The bass will be there another day, they won't mind if you don't spend time with them for the day. Last night I learned of a surprise fishing partner for today's fishing expedition. 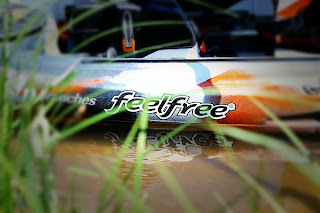 I pulled my FeelFree Lure off my car, and mounted it atop my Jon Boat that my partner would be using. Before getting my kayak, the Jon Boat was my primary fishing vessel. It took me to places a large boat could not, and was much lower maintenance. Well, I have since purchased a FeelFree Lure in Camo Orange. Camo orange is my new olive green. Boats still have their place in fishing. However, my Lure proved its worth as my primary fishing vessel today. I was able to take it places the Jon Boat was stuck. 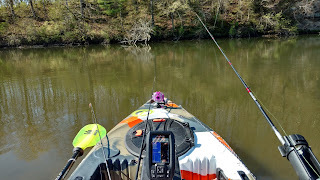 But no worries, I was able to tie it to the back of my FeelFree Lure and drag it under the power of my Bending Branches Angler Pro with very little extra effort. We event tied together to explore a creek that fed the river/reservoir we were fishing. An impractical feat until I had this versatile fishing machine. My participation in the KBF Great Lakes May fishing tournament is my first in my fishing tournament career. It has been great. TourneyX provides an easy-to-use, fair, and well-managed platform to submit and track progress in the catch-photo-release tournament. I was previously in 3rd place in the tournament, then bumped to 5th. Today I was then bumped to 7th and was determined to climb the leader board. 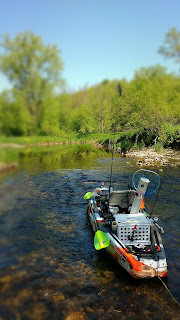 This morning I launched the Jon Boat (captained by a fishing partner) and my FeelFree Lure. I was determined to move my way back into the top three. The day started at a bitter 39 degrees, but the forecast was promising. Temperatures were to be in the 80s with little-to-no wind. Perfect small craft fishing conditions. Shortly after launching, my fishing partner landed a nice 16"+ bass on his second cast (the first was a snag I helped retrieve). We agreed it was going to be a great day. The Wisconsin spring has made for tough fishing. The temperatures have fluctuated significantly over the past few weeks, causing extreme changes in water temperatures. This has confused the bass, and confused this bass fisherman. My confusion persisted for several hours through the day. We tried plastics, frogs, cranks, spinners, buzzbaits, and other usual suspects in our bucketmouth arsenal without success. 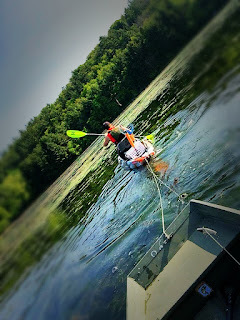 We even tied the boat to my kayak so I could pull it into the shallows where the bass were recently spawning. 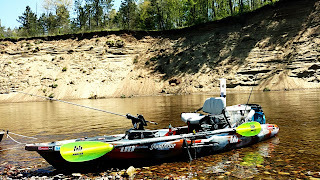 To break the grind of fishing, we decided to explore and head upriver to pools we had been told about. We left the 61 degree water for crystal-clear 53 degree creek water. After numb feet dragging the boats in shallow stone creek beds, we found a beautiful fishing hold filled with thousands of Brook Trout. A beautiful area mostly untouched by the average human. After spending some time exploring and fishing, we decide to head back to the open water when another fishing partner texts me. He is on the lake and doing well. Our curiosity peaks and we head downstream. After meeting up with my friend, he indicates fishing has been great. He lost count of how many fish he caught. They were caught on the frog. Frustrated that I did not stick with my favorite lure, I tie mine back on and start throwing it. My friend hooks up on a nice, fat, 18" bass. Determined to get my frog inhaled, I continue fishing. I'm able to stand-and-fish in my FeelFree Lure. I spot several nice bass in the abnormally clear water. They are not interested in what we have to offer. As the day burns, we decide to give the shallows with weed mats one more try. 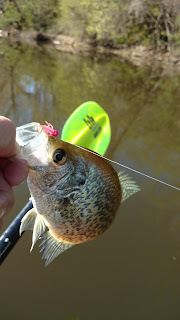 To ensure I do not get skunked, I stop at my favorite panfish crib and instantly catch a bluegill on a Panfish Plastics Chigger Fry. I am satisfied and move to the shallows. The shallows are active. The water temperature has risen to 68 degrees. Minnows are everywhere and the groups of water boils indicate bass are chasing the bluegills. A few tosses of my frog and I miss a hit. Frustrating, but promising. We move deeper in the weeds and another fishing party member hooks up on a bass. I'm also spotting them swimming around me as I stand and paddle. Two missed hits later, I finally snag a largemouth. Thankful for my 50 lb. braid, I haul it, and several pounds of weeds, into my kayak. With excitement I pull my Hawg Trough out and adjust my Tourney Tag to ensure a proper photo for the tournament. This bass is not in the mood to cooperate and nearly escapes during the photo process. However, I'm able to calm it down enough to take a proper picture. My fishing partners continue to miss fish due to the addition, and frustrations, of frog fishing. I hook up on another fish. 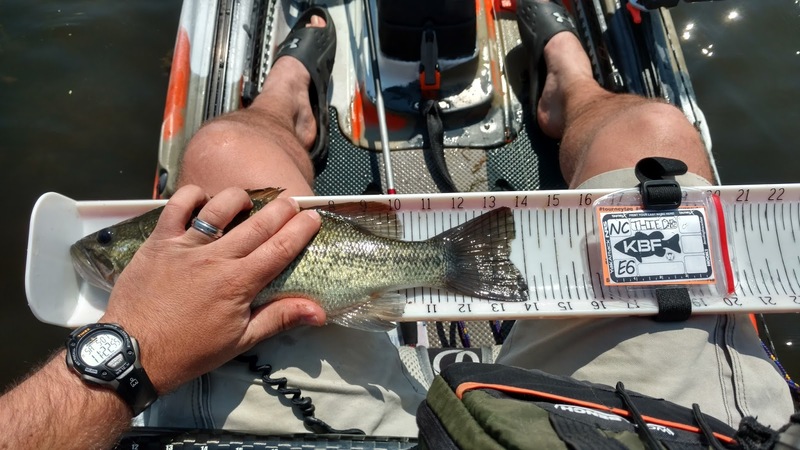 As I'm pulling the fish into the kayak, I begin thinking, "This thing isn't huge, but big enough to get me back into 3rd place in the tournament. He better not fall....". The fish then flops loose and swims away. If it had a middle finger, it surely would have been showing it to me. As I shout a barrage of language fit for a pirate, we continue to work the length of the weed mat. We then decide to call it a day and head towards the docks. Today was a grind. It was hot, the bite was slow, and we covered a lot of water. However, today was a beautiful grind. I love fishing and would love to do it for a living. However, I proceed with caution. Never do I want my passion to be a "job". No matter the results, a day enjoying my passion with friends and family is a beautiful day. "When life throws you lemons, make lemonade. ", or so they say. I prefer to take said lemonade, add vodka, and have a party. Today's lemon was the weather. My vodka was my family. Terrible weather coupled with equipment neglect yesterday made me eager to hit the water today. After a nice day with the family, and a poor weather report for the following morning, I decided to sleep in. When I awoke to the smiles of my wife and kids and a hard frost, my decision was confirmed. The temperature outside was 25 degrees. 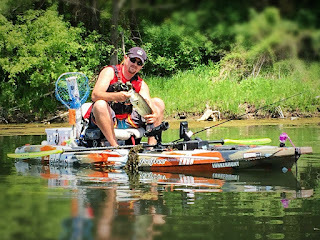 During my lazy Sunday morning with the family, I fired up the DVR and watched the latest episode of Knot Right Kayak Fishing. This made me think of my newly strung poles, recharged battery, and dwindling KBF/TourneyX tournament standing. My daughter and I formulated a plan. I would hit the water, break in my new line, and attempt to regain my top three position in the tournament. Once the temperature rose to an appropriate level for the time of year, I would text my wife. They would join me at the beach for a photo op with my wife's professional camera. My daughter and I would stay behind to play in the sand and fish. After my load-drive-unload ritual, I'm on the water. The wind had picked up but is manageable on the lake. My new crate and tankwell configuration on my FeelFree Lure is lower. I notice the setup is much better. No longer is my tall crate catching the wind. The water temperature is borderline shallow/top-water action. My Garmin Striker shows a borderline temperature of 52 degrees. Hopeful the unseasonably cold temperatures did not impact the bass, I head to the spawning grounds. I cross my toes as I toss my buzzbait. The wind has already picked up to the foretasted 10-15 MPH. I'm hopeful it will still draw bass in the 1-2 feet of water. No luck. 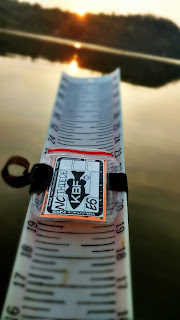 I experiment with tossing a joined swimbait and plastic swimbait into the shallows and up the ledge. No luck. I hesitantly migrate to the shallow bay where I witnessed heavy spawning activity last week. I gently drift into the bay and spook a nice Largemouth off a bed. 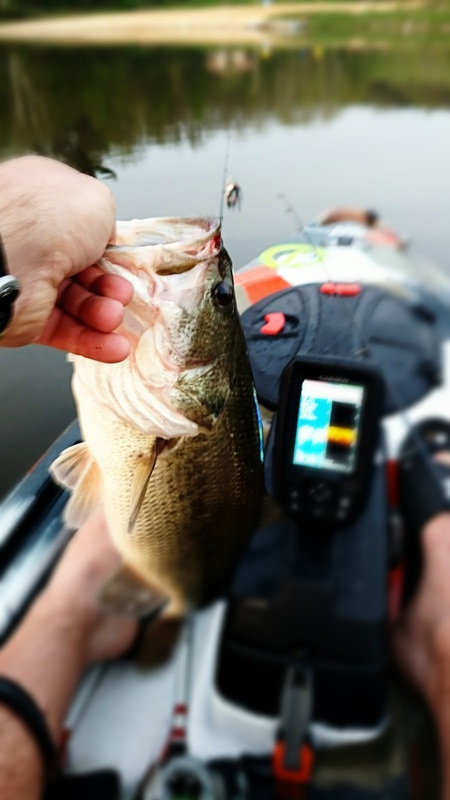 With the eagerness of a child tearing open presents on Christmas morning, I quickly tie a frog on my baitcaster. They are still shallow!!!!! The water is crystal clear in the bay. An oddity given the rain and otherwise stained waters of the reservoir. I'm able to stand and sight fish the waters in my FeelFree Lure. I tried my buzzbait, several finesse plastics, and the frog. Though I spot many nice Largemouth, none are interested in what I have to offer. Having planned a photo session, my wife texts to confirm they are on the way. Perfect timing. My family arrives and we take many photos. Be sure to check out my Instagram account to see more photos. I pull up to the beach to say hello to my daughter. She had previously expressed interest in joining me on the kayak, but I didn't think she would want to on this windy day. 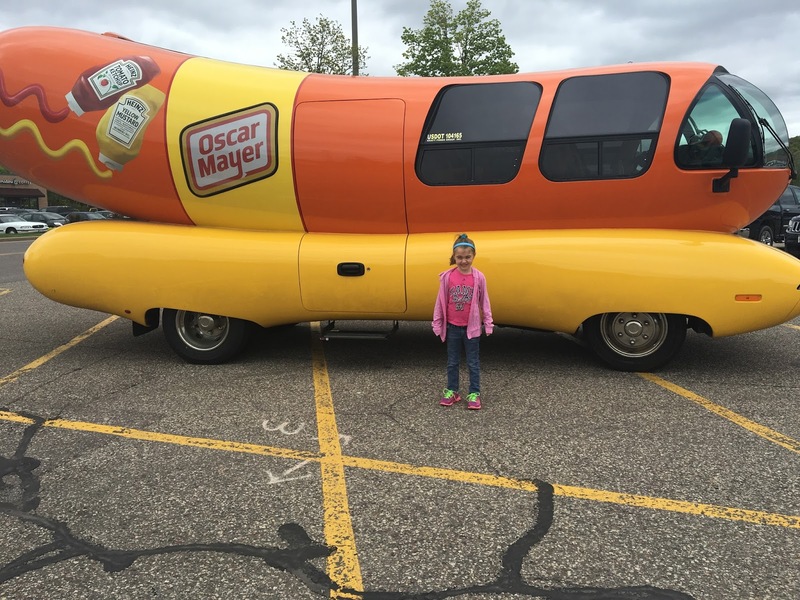 Much to my surprise, she asked if she could go for a "ride". Luckily, I had preemptively placed her PFD in the hatch. 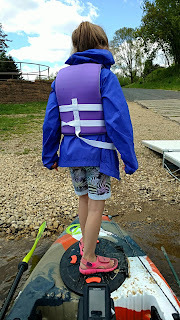 I put away my fishing gear, helped her put on her PFD, and we were floating. She loved it, but the wind on the water was a bit frigid. We beached the kayak. She used my FeelFree Lure's Gravity Seat on the beach while I attempted to snag the many fish I was marking during our short paddle. 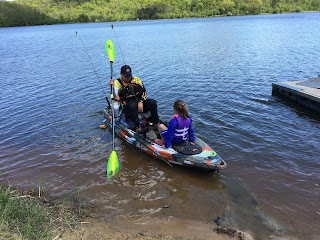 After unsuccessful attempts to rip lips from shore, my daughter opted to land the kayak. "Where is the Jeep? ", she asked. I pointed around the bluff, where the boat landing was. 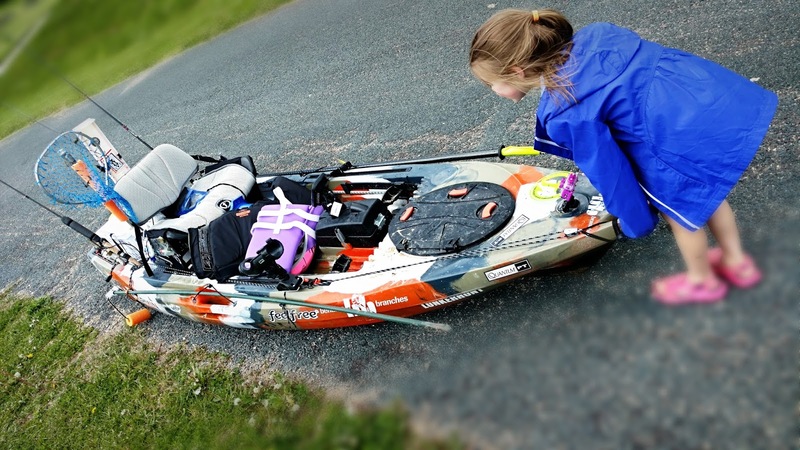 With a smile, she starts putting on her PFD as I begin packing my fishing gear for the float to the ramp. We board the kayak and paddle to the ramp. I am sure to take time to point out the beautiful rock ledges and trees. I also show her how to read my Garmin Striker. As my First Mate, she begins calling out fish, structures, and the water depth. Upon arriving at the dock, we receive the usual stares. 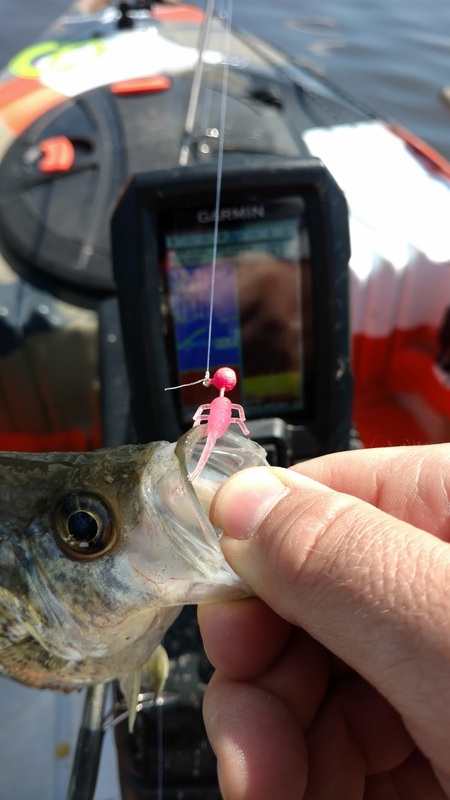 My FeelFree Lure has drawn the attention of people driving past my house, people in the parking lots/boat ramps, boaters on the water, and kayakers on the water. With a small audience, we land. My daughter has now become accustomed to the stability of the FeelFree Lure and eagerly walks up the bow and steps onto land. I do the same. 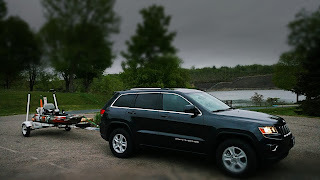 I proceed to use the wheel in the keel of my Lure to push it up towards the trailer. My daughter attempts to help. Weighing in at twice her weight plus gear, she is unsuccessful. 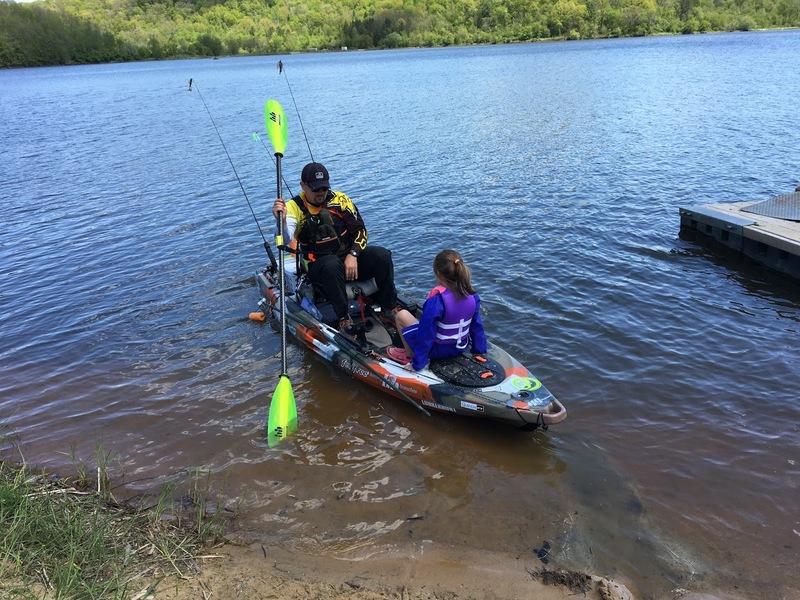 We prepare the kayak for transport and enjoy some time at the park near the boat ramp. We head home with smiles on our faces. 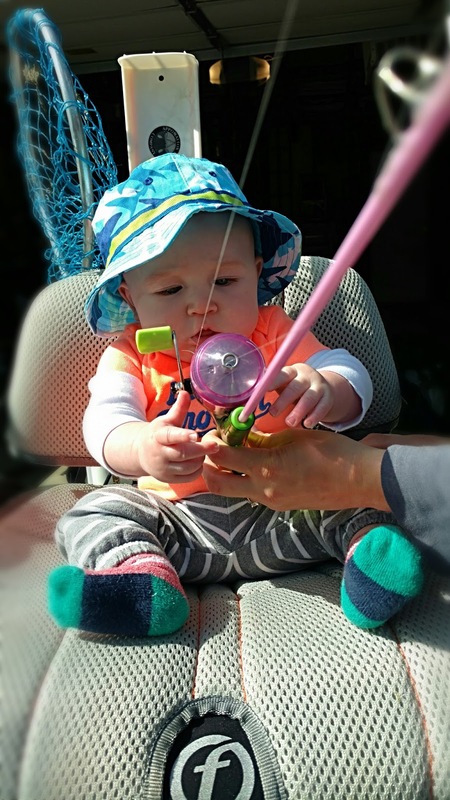 My son, jealous that his sister was able to ride on my Lure, borrows his older sister's Tinkerbell pole. He is a future kayak angler in the making. I love fishing. I have increased my involvement by starting my fishing tournament career. I love the challenge and competition of the tournament. By tournament fishing standards, today was a failure. However, I still choose to take the lemons the weather handed me today and make lemon vodka. I enjoyed my time on my kayak fishing. I enjoyed sharing the outdoors with my family. My daughter also took her first paddle on a kayak and loved it. If not careful, your passions/hobbies could become a stress in your life. I'm taking my hobby to the next level, but keeping this in mind, I always make the best of it. If not careful, I could cross a line and my hobby could become a "job". In the end, though I did not catch any fish, today was a great day. Be safe, tight lines my friends. Today was "one of those days" on the water. Yesterday was Friday the 13th with a full moon. The day went without incident for my family and I, except for the weather report for the weekend. However, I was optimistic. I've fished in harsher conditions (though inside a shanty with a Mr. Heater). The weatherman was calling for below freezing temperatures and 20 MPH winds. 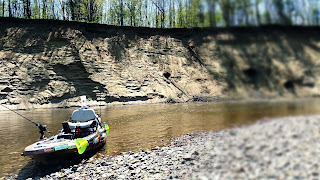 Just over a week ago it was 90 degrees for my river float. 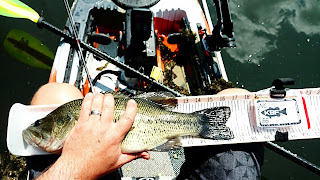 The following day the bass were shallow for the spawn and hitting topwater. I even got in my first frog action of 2016. 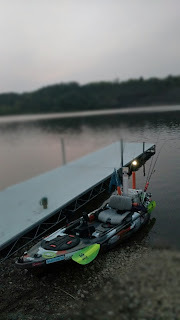 Hopeful the week's 40 and 50 degree temperatures didn't drop the water temperatures too much, I tied on a buzzbait and frog while I prepared my FeelFree Lure kayak for an early morning departure. I also packed a pair of ice fishing gloves and heat packs. My alarm clock rings and I slowly roll out of bed. I'd love to stay in the warmth of my bed, knowing the fall-like weather awaiting me. No excuses. I have a KBF/TourneyX tournament to work at. I slip on my clothes typically reserved for ice fishing/snow biking, catch up on my social media accounts while sipping some coffee, and wander out the door. I arrive at the lake. The empty parking lot confirms I read the weather report correctly. It is 34 degrees. As I sit in the warmth of the vehicle, I remind myself some of my best fish were caught in harsh conditions. I turn off the vehicle and commence my now automatic kayak loading ritual. All morning I felt "off". Perhaps it was the beer I drank last night, or the abbreviated sleep to arrive at the lake early. I brush it off and paddle towards the spawning grounds while staring eagerly at my Garmin Striker's temperature gauge as it adapts to the water. Choosing the "ignorance is bliss" approach, I decide to ignore my Garmin's rising temperature reading. Arriving at the spawning grounds, I immediately need to deploy my stakeout pole. The wind has already picked up and causing whitecaps. This is going to be a tough bite. I nervously toss my buzzbait a couple times. Like a kid peeking through their fingers during a horror movie, I hesitantly glance at my Garmin's temperature reading..... 52 degrees. My heart sinks as I cut off my topwater baits and switch to my fall lures. My baitcaster and spinning rod are now in my go-to fall mode. A spinner and a swimbait. I maneuver towards the center of the lake and re-plant my stakeout pole in 2 feet of water on the edge of a ledge. I work both baits up the ledge which rises from 25 feet to 2 feet in a short distance. These ledges are a great target area when the bite is tough. The river enters the lake near this area. Unless the bass are shallow, they typically suspend along this ledge depending on their preferred temperatures. This is when my trip takes a turn for the worse. It begins with my Garmin shutting off. 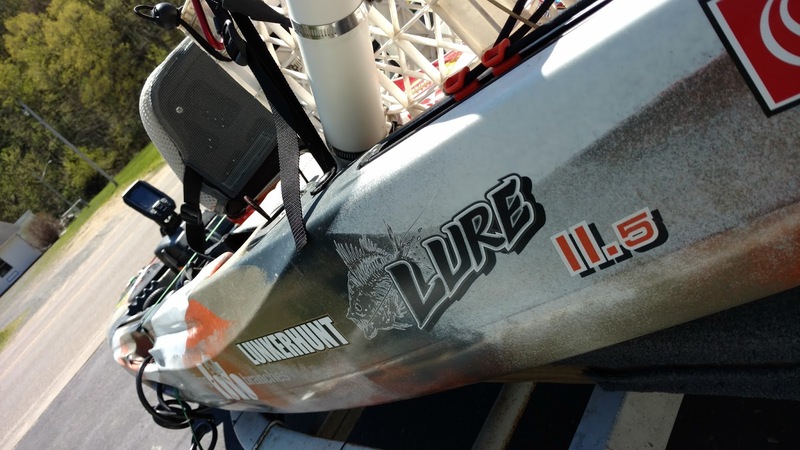 I promptly check the battery connections in my FeelFree Lure's sonar pod and turn it on again. I glare at the low voltage reading as it again shuts off. I haven't charged my battery after several days of use last week! I am partially blind, but I know this body of water like the back of my hand. No problem. I admittedly was cheap when re-spooling my spinning rod this year. I bought bargain line, which I will not name, for my daughter's Zebco 33. A fine line for her use. Not a good idea for my rigorous use. 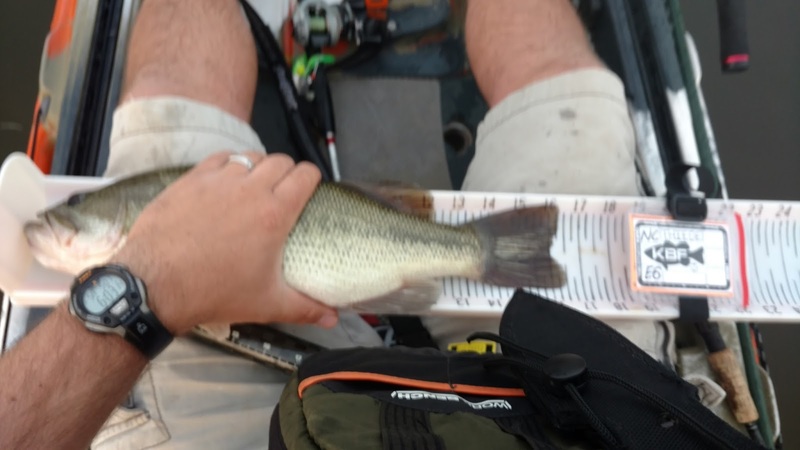 The line had concerned me when landing my first large bass of the season last week. When flipping the bass into my kayak, the line snapped. Today, as my spinning reel's grease struggled with the cold, the line snapped while casting. Before I trust this pole with another lure, I need to restring it. One primary pole down. I begin tossing the spinner on my baitcaster through the spawning area. I also try slow-rolling it up the ledge. Amidst this effort, during a cast into the wind, my spinner stops suddenly a few feet from my kayak and drops into the water. Assuming a backlash, I look down at the reel. No backlash. Confused I inspect the length of the rod. A large knot is in the line. Admittedly, I should have re-spooled my baitcaster. After some nasty hangups on the river, my spool was a bit lower than I prefer. Now the already low spool has been further reduced. I have micro guides and cannot feel my fingers in the bitter cold (I learned you cannot use ice fishing gloves to operate a baitcaster). I reluctantly cut out the knot, and re-thread the rod. I decide to give up on the ledge and head to the rock dam. Rock structures are great with temperature fluctuation since they hold their temperature for longer. I let the strong wind push me towards the rocks while I cast. I quickly notice a problem. My casting distance is significantly reduced because of the little remaining line on my spool. Determined not to let this day defeat me, I paddle to the rock and drop anchor. Upon arrival at the dam, my wife texts me to see how the morning is going. I believe she did this out of 10% curiosity, 10% genuine concern, and 80% hope that she could say "I told you so" (she figured the weather would cause me to come home early), I report back with current status. I'm down to 1 pole (my backup pole is nearly out of line) and it is snowing. Yes, it snowed today. In May. While kayak fishing. After frustrating short casts, I decide fate is telling me today is not my day. I report back to my wife that I'm heading in early and will try again tomorrow. In the end, today was a great day. I got home early and went shopping with my family after enjoying fresh, local, donuts for breakfast. We had a great time while shopping. 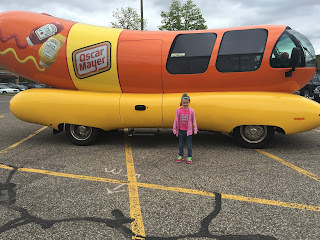 My daughter got to see the Oscar Meyer Weinermobile for the first time. She also decided to get her ears pierced. I'm grateful for the multiple equipment failures today. Without them, I wouldn't have has as great, or long, of a day with my family. However, this is a lesson learned. My neglecting to maintain my equipment caused major problems. Luckily, I was fishing waters a few minutes from home. Had I traveled any distance, it would have been a major waste of time and money. Take care of your equipment and it will take care of you. 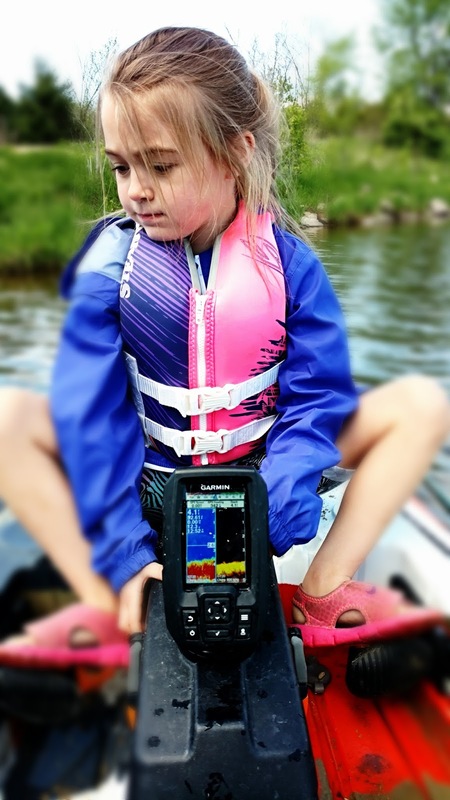 And if you are fishing in a tournament, don't use the cheap line you bought for your child's pole. Having now properly re-strung all of my poles with Suffix line, I hope to report back differently tomorrow. Be safe and tight lines my friends. As with other parts of the world, Wisconsin has sacred days. Do not make plans with those participating in these events in Wisconsin. These days include opening of archery deer hunting, the rut, gun deer season, turkey season, first ice (ice fishing), or any event allowing an excuse to drink beer (especially in public). Today's sacred holiday was fishing opener. Wisconsinites are now able to fish game species on all waters. No more panfish or carp.... It's on like Donkey Kong. As per usual, I meticulously prepare my lures, load my kayak, and pack my tackle. Though my home water is 3 minutes from my front door, I cannot waste any time returning home for forgotten equipment. A short four hours later, I awake at 4 AM. Like a kid on Christmas morning, I am tired and excited.... I thought to myself, "I can sleep for another hour.....". After a failed attempt at sleeping, I give in shortly before 4:30. I tip-toe around the house as not to disturb my wife and kids. Like a kid waking too early on Christmas, I sneak around and peek at what is to come today. I check the weather. Chance of wind, no problem. Otherwise nice (save for the air quality warnings caused by smoke blowing through Western Wisconsin from the Canadian wildfires). I verify my phone is charged and that I'm logged into my TourneyX dashboard. 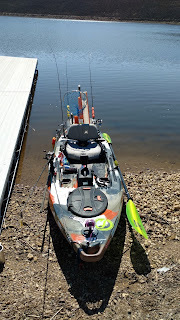 I plan on catching bass, and want to ensure I'm ready to upload my catches to the Kayak Bass Fishing North Central Great Lakes May tournament I'm participating in. After getting my go-go juice (coffee and soda), I'm off into the darkness. I arrive at the lake and am greeted by a seemingly empty lake. Great. Early bird gets the worm, as they say. I perform my rigging ritual and use gravity and my FeelFree Lure's keel wheel to launch my craft. It is still quite dark, so I turn on my light for safety. I expect several boats to arrive shortly. Given the spring we have had in Wisconsin, I wasn't sure what to expect. Thus, I had several lures tied on for my go-to tactics. My best spinning rod had a chartreuse buzz bait, my baitcaster a chartreuse spinner, and my other spinning rod a jointed Rapala. I opted out of tying on a frog, not convinced the water temperatures would allow for frog season. I first paddle to the rock shore. Rock tends to hold a more consistent temperature, attracting the fish in extreme temperature changes. As I arrive, I'm surprised to find a fellow kayak angler working the rocks. After a few casts with no action, I move on. I know the water well enough to know how quickly to expect activity in various areas. I look at my Garmin Striker's temperature reading and silently cheer while doing a "fist pump". It is 62 degrees. I go for broke and head for the shallows, hoping the spawn is on. My gut feeling is confirmed after a few casts of the buzzbait in the shallows. My first bass of 2016, and in my FeelFree Lure, is on! It wasn't the glorious top water blowup us anglers live for, but I was appreciative. The lake was quickly hosting other kayaks, canoes, and boats. I did not want to make a scene and attract others to my location. After a short battle on my spinning rig with 6 pound mono, I pull the fish into the boat. In true fashion of my home fishery, she is a tank. What she didn't have in length, she made up for in girth. As I swing her into my cockpit, my line snaps, my heart stops. She must have understood the importance of her coming into my life and stayed calm while I grabbed my Hawg Trough for its inaugural measuring. Fishing tournaments are new to me, I'm smiling like Ralphie in A Christmas Story ready to shoot my Red Ryder BB Gun for the first time. As I hold my catch and draw my Hawg Trough from my crate, I quickly learn an additional challenge of CPR (catch-photo-release) tournaments. 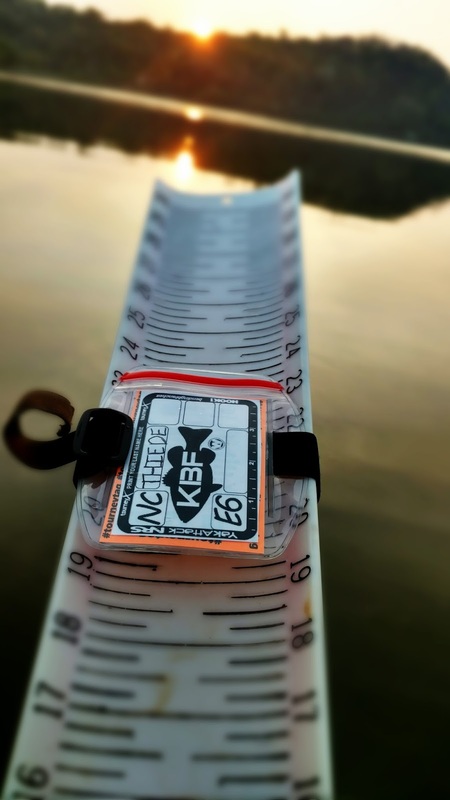 Keeping the fish on the measuring board, in the boat, while taking a photo, with the identifier in clear view. Luckily, the folks at Tourney Tag took 95% of the challenge out of the equation for me. Their amazing product keeps my identifier safe from the elements, secured to my measuring board. Had I needed to hunt for the identifier in a sandwich bag, I would have lost 2 of the 4 fish I landed today. Given the weight of this bass, I was a bit disappointed by the length. However, I have no complaints. My equipment and knowledge performed flawlessly, I've officially submitted my first TourneyX catch, and it is a beautiful morning. Life is good. I carry on working as much water as possible with the buzz bait. Knowing the wind will pick up as the day continues, I take advantage of the calm waters. Several fish swirl at it, but no hits. After working the shallow area, I move to a shallow point in the lake. Given the bass are in shallow water, they must be partaking in some spawning activities. After a few swirls, I successfully antagonize another largemouth enough to hit the buzzer. As with the first, it is not the majestic top water blowup we love. It is a gentle grab of the bait, again, perfect given the growing audience on the lake. If Ralphie hadn't shot himself in the eye, his face would have looked like mine. I was smiling ear-to-ear. I cannot believe it. An adverse spring with fluctuating water conditions, within an hour of opening morning, and I'm about to have two on the board! (Pun intended). I measure, position my Tourney Tag, snap the picture, and submit it to the folks at TourneyX. I'm a bit disappointed buy the length. But it is a great start to the tournament and season. The bite quickly turns off. Word has spread on the largemouth interwebs not to bite the loud, bright green thing dashing through the shallows. I decide to employ other tactics as the lake begins to get busier and the weather conditions change. I roll the dice and target the location where I've caught my two biggest bass in this water. Unfortunately, it was too soon. This area of the water is too clear and too cold. With the bite slowing, I too realize I'm cold. I'm dressed in my PFD (of course), a tshirt, shorts, and sandals. But I've ridden my fatbike in -30 degrees. This is the tropics in comparison. As I continue working the various areas of the water, I continue unsuccessful. 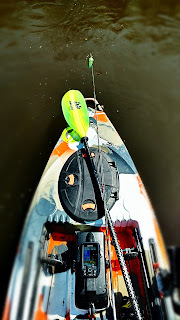 I'm able give my mind a break on three separate occasions by fellow kayak angers paddling up to me and asking me about my FeelFree Lure. They are interested in the look. They are also interested in how I can stand, paddle, and cast so easily. I happily give them the elevator speech on the Lure's stability, sonar pod, gravity seat, and wheel in the keel. Several other kayak anglers also paddle near to grab an obvious glimpse of my kayak and its branding. I love teaching and sharing the love of the sport and the companies who make the equipment I use. 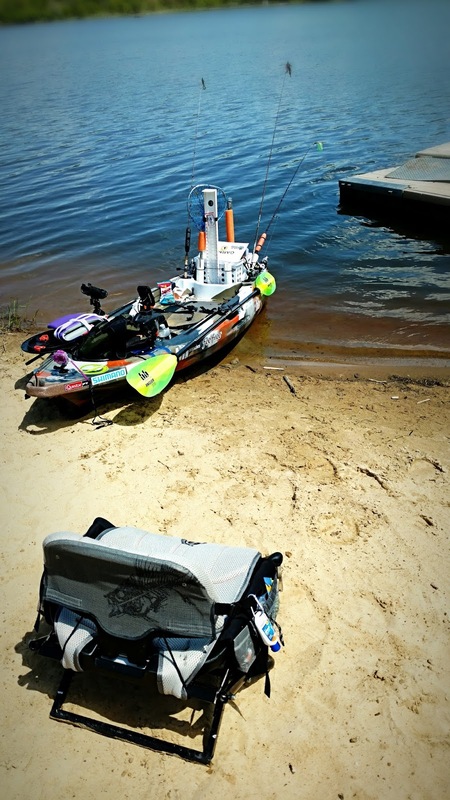 I also share with them the CPR tournaments hosted by Kayak Bass Fishing and TourneyX. 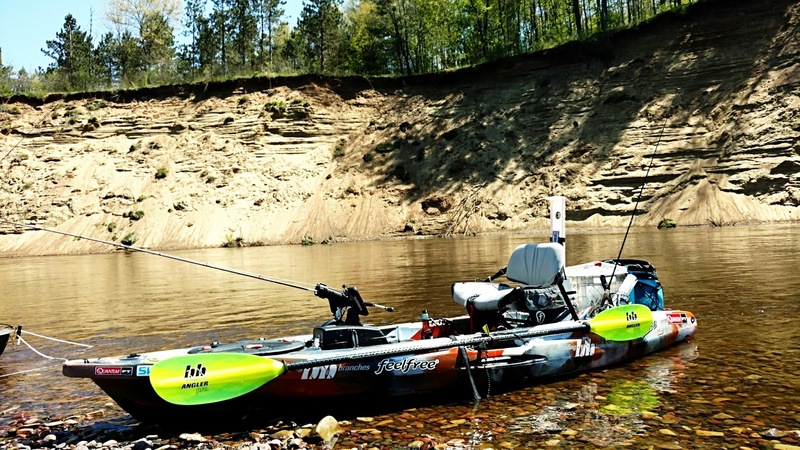 Kayak fishing is exploding. This is my third summer fishing this body of water regularly. I have never seen more than 2 fishing kayaks on a given day. 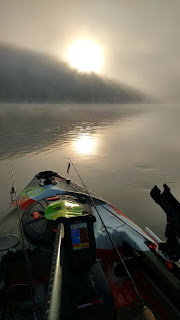 I counted over 12 fishing kayaks today, opening morning of bass season. Amazing. 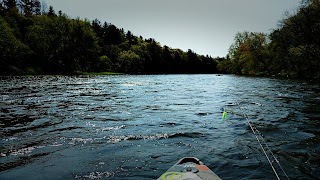 As the wind speed picks up to the foretasted ~20 MPH, the kayak fishing herd thins. I smile as they gather at the landing to seek refuge. 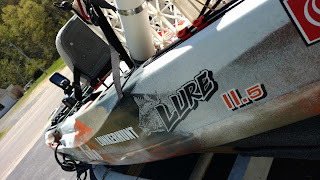 My FeelFree Lure can take the rollers broadside. However, my 6 pounds of dumbbells are not holding in the current and wind. Time to roll the dice one more time. Frogs are my favorite lure. I love them. Wisconsin waters are filled with algae in the summer. Not the beautiful water plants you see in the fishing shows from down south. The mats are thick, slimy, green bodies that smell like mud and decomposing worms. Frogs thrive in this environment. I'm lucky enough to find this luscious greenery in another shallow spawning area. 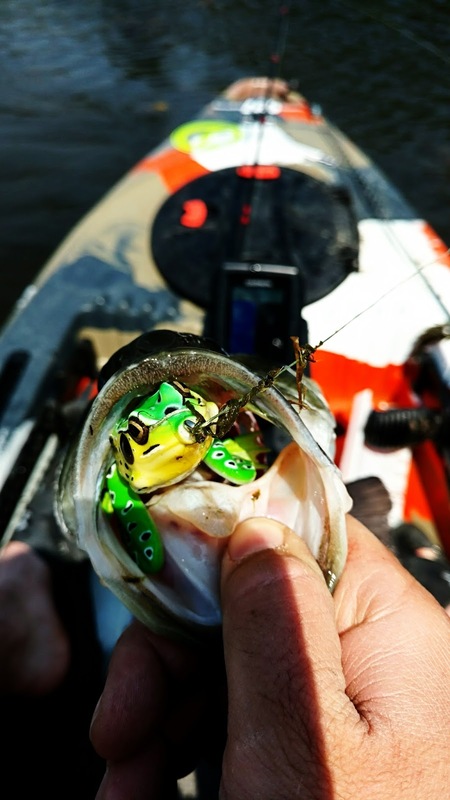 As I tie my favorite frog onto my baitcaster's 50 pound braid, the Lunkerhunt frog, I grin. This setup is my Barrett 50 caliber, my Ferrari, my Chuck Norris. This setup is my go-to when in doubt. As I navigate the shallow waters and mats, I stand and paddle to see fish darting everywhere. Bluegill dart about while bass chase them out of their beds. Perfect. I start tossing my frog to the various mat patches. I quickly get a hit. My Suffix braid and Quantum KVD setup perform as expected and haul in a bass along with pounds of vegetation with ease. I put the latest quarry on the measuring board, snap the photo, and submit it to the folks at TourneyX. Again, a bit disappointed with the length, but I'm not complaining. It is a beautiful day, on my favorite fishery, my equipment is working flawlessly, and I've slid into (an unconfirmed) third place in the KBF/TourneyX tournament. As I stand and paddle deeper into the shallows, I'm able to see fish darting around. I stop and notice a tailfin of a largemouth bass casually swinging above the water. This one is working on some spawning. I quickly slide my stakeout pole through my anchor trolley and into the mud. I stop to watch him flip, dig, and flop about. I toss my frog past the bed multiple times. I try longer pauses, quick retrievals, noisy pops, and noisy overhand cast landings. The bass is oblivious to the tasty frog asking to get inhaled. I tie my football jig with craw trailer onto one of my spare spinning poles. A bad idea chosen out of desperation. The fish wasn't large, but enticing one off the bed is always addicting. I am not accurate with a spinning reel. Nor is a 1/2 oz with craw trailer a quiet landing. As it hit the water, the fish darted away. It wasn't meant to be. 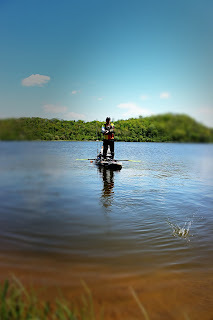 I pull up my DIY stakeout pole along with 5 pounds of mud and algae and secure it to the side of my kayak. I've decided to allow the wind to take me out of shallows. I've hit my goal of limiting in the tournament, time to spend the rest of the day with the family. As I drive towards the main body, I'm able to entice one more fish on my Lunkerhunter frog. My KVD Quantum rig with Suffix 50 pound braid horse it, and several pounds of algae in with ease. I land the fish and put him on the board. I've already reached my three fish limit in the tournament, and he is smaller than my other three fish. I realize this, of course, after he is the most difficult catch of the day and stabs me with his dorsal fins during a picture attempt. Though the weather is finally warming, the wind is becoming more constant. The smoke from the Canadian wildfires is thick and causing coughing. The fish are still biting, but I'm content. I'll be out another day to increase my catch length. I have a family to spend time with. This is a bass opener for my books. I didn't think I could love fishing more than I already did. But fishing from a kayak in a CPR tournament brings a whole new level of excitement. If you haven't tried either, I suggest you do. There is a certain solace in a human powered fishing machine a few inches off the water. It requires a heightened sense of planning, rigging, and security. It is a challenging, freeing, and relaxing experience like no other. 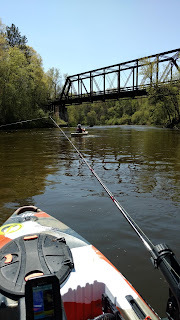 Last week, with bass season closed in most Wisconsin waters, I took to a nearby river. 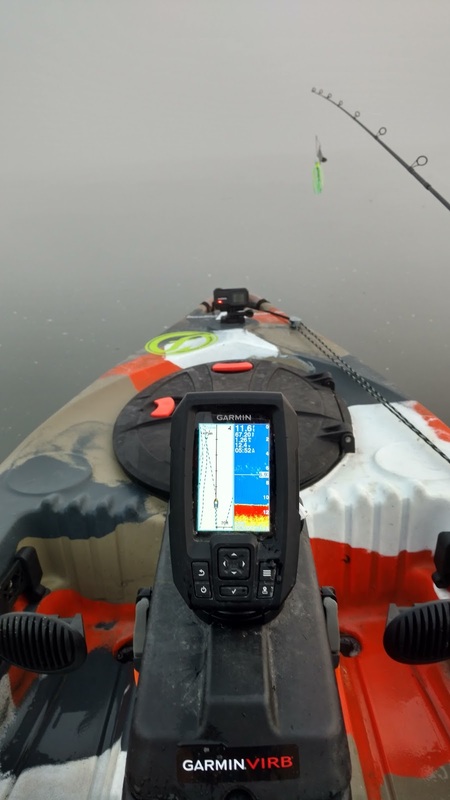 If you haven't read about my Bass Goggles clouding my judgement and nearly invoking a "code brown", check it out. I was determined, when conditions normalized, so avenge my pride and tackle the same river. This opportunity was presented this last week when a new kayak fishing buddy of mine was looking for partners to float the river via our local Facebook Group. 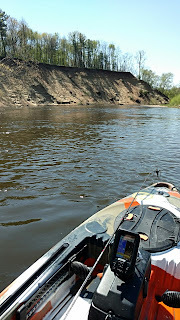 We called a local kayak rental/launch site to confirm parking and they indicated the river had dropped over 8 inches since my treacherous adventure. We were planning the float for Friday, the day before Wisconsin fishing opens on other waters, and the local news was calling for an unseasonably warm 90 degrees. We planned a float. The night before I carefully prepped and loaded my kayak and gear. I rigged my DIY drag chain to help control my speed in the current (I learned last time anchoring in the current isn't a great idea). After successfully threading and testing the drop chain control through the rudder hole on my FeelFree Lure, I was confident I was adequately prepared. Morning-of, I eagerly fire up the vehicle and head west. I meet my buddies at the launch site. We unload and do the vehicle shuffle to our takeout spot. Our launch site was a steep bank with an old staircase. 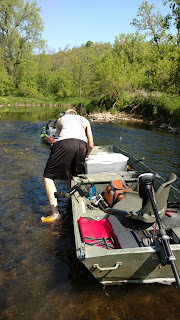 With some help (I was fully loaded with tackle and a cooler), I'm floating and we are off. 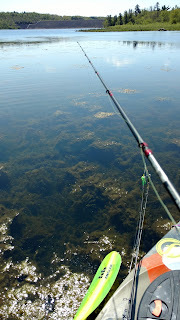 It takes me a few moments to adjust to the current, I am typically a lake fisherman. However, I drop the drag chain and my Garmin Striker GPS speed reading confirms it is working. The weather is beautiful, and my Garmin shows the water temperature gradually rising with the heat, a balmy 56 degrees. The fish aren't biting as we float, but I don't care. 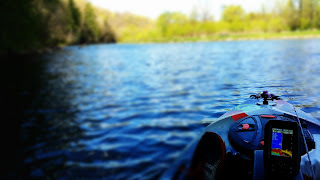 This is my first kayak river float in good conditions. It is a beautiful day and I have great company. Life is good. A bit downstream we stop on a small island. One of my party members gets a smallmouth to hit in the calmer, warmer water on the other side of the island. He suggests tossing a senko, so I quickly rig one wacky style and oblige. Naturally, in my excitement, I snag immediately. After using colorful language and fierce tugs, I free the snag. Eventually, after no bites, I get a snag I cannot recover. We move on. 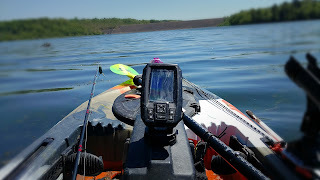 After more distance without a bite, I am comfortable with my equipment in the river environment. I easily stand and try sight fishing. My kayak allows me to do this effortlessly. I'm able to adjust the angle on my Garmin Striker so it is visible from a standing position. This also proves unsuccessful. 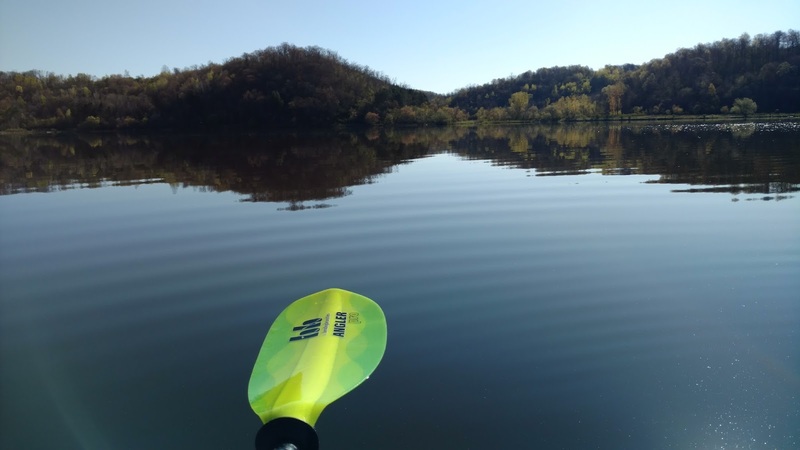 However, I do see a LARGE Walleye casually swim under, next to, then away from my kayak. It shows no interest in the lures I have to offer. The fish are slow. We had an early warm in the spring, but it turned cold again with several snows. The water temperature was nearly to spawning condition when it dropped again. The bite is tough. However, my Garmin Striker tells me the sweltering heat is increasing the water temperature, now 58 degrees. Wisconsinites are used to -30 degrees, not 90. The cool water feels good on the legs as we float. We are loving the float, but a bit deflated from a fishing standpoint. After going over some swift, rough, water, we encounter a beautiful scene in the river. It snakes through large sand banks edged with smooth river rock. An amazing sight. Naturally, we stop to water the weeds, cool off in the water, and take some photos. We carry on with the float and one of my group members doesn't see a large tree down in this path. He quickly finds himself entangled in the limbs. We are yelling, notifying him of his pole, leash-free, getting stuck in the branches. It falls in the water. After safely freeing himself from the limbs, we gather on the bank and assess the situation. My kayak is stable, but not built for speed. I take his other pole and he ventures back into the current. While searching for the pole, the situation turns worse. As I see a large "stick" floating downstream, he yells, "I lost my paddle!!!!". I quickly shove off into the current and find the paddle around the bend stuck in another down tree. 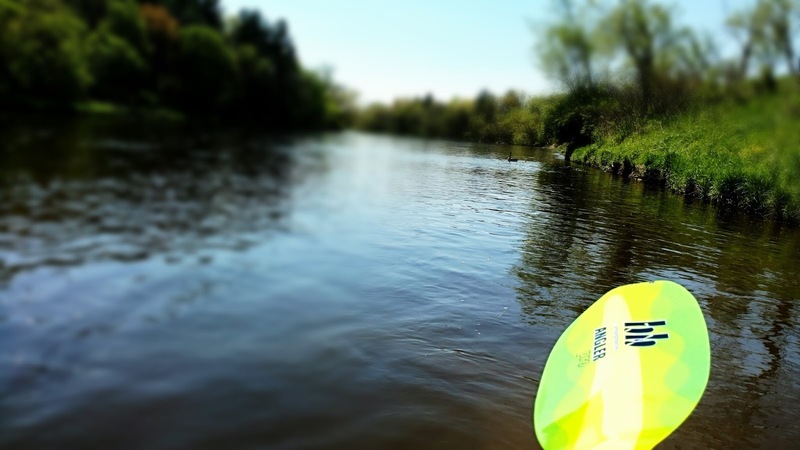 I paddle furiously to align myself in a position to recover the paddle. I'm able to recover the paddle, but find myself wedged in the tree. My kayak tips slightly in the current and begins to take swift water over the side. I lean the opposite direction as my scupper holes do their job. I'm able to escape the current without rolling. I love the stability of my FeelFree Lure. I holler "I've got it! ", while my buddy cheers. Our other group member floats near him as we meet to return his paddle. The new rod and reel is gone. But we are safe and carry on. Given the poor fishing conditions and a time restriction, we casually cast while fishing the float. This river is beautiful, my equipment is amazing, and I'm in good company. I'm addicted. I take in the scenery as we near the end. We round the bend and approach our take out location. A large group of kayakers are launching. My kayak's appearance (and my ability to navigate while standing) draws the usual questions that I love to answer. We wish each other well while we part ways. Our group pulls our boats ashore, retrieves a vehicle, and load up. We are tired, hot, but happy. It was an amazing float on a beautiful river. We plan to float a bigger stretch soon, with more people. 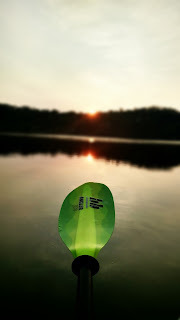 Kayaking has opened new worlds to me. I loved fishing via a traditional boat with batteries, motors, fluids, plugs, hot metal, etc. 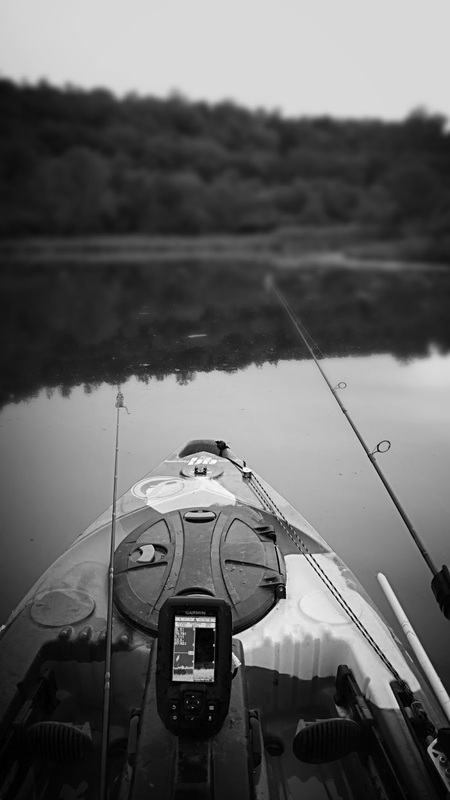 There is something about fishing from a kayak that has increased my love for the water and fishing. It is an amazing experience that increases your awareness of the water. I can go places I could never go, even in a flat-bottom Jon boat. I look forward to my adventures to come and sharing them with you. all the creatures were stirring, especially the spouse. in hopes that Mr. Largemouth would give them a stare. while visions of topwater blowups danced in their heads. had just settled our brains for a short spring nap. I rose from the bed, hoping my drag would soon be singing. Tore open my coffee and loaded up the 'yak. Gave the luster of mid-day to the largemouth below. But a dawn top-water blowup on my baitcasting gear. I knew in a moment it must be a monster fish. and he splashed, and darted, and surely cursed my name. Wishing everyone a safe, happy, successful bass season! Work, stress, bills, politics, media, interstates, traffic, phones, social media, and the list goes on... These things are part of today's society. Everyone needs a "Happy Place" to temporarily escape. For my wife, it is getting lost in a good book. For Happy Gilmore, it was an odd dreamland destroyed by Shooter McGavin. Mine is found at my local reservoir. I've spent countless hours fishing my local reservoir, learning every structure and contour. The time I have invested here makes me secure and provides me a sense of familiarity. I'm familiar with the water, weather, and fish patterns. 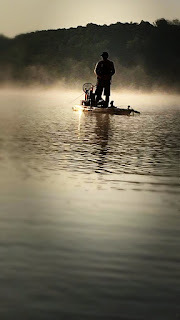 There is no stress related to water, weather conditions, or finding fish. Anytime I struggle fishing other waters, I come here to normalize and find my Moment of Zen. With bass season closed in Wisconsin, my Garmin Striker 4DV sonar guided me to my first GPS waypoint. A crappie crib. As expected, my Panfish Plastics Chigger Fry immediately delivered crappie. Quickly followed by several more. Though my carp fishing was unsuccessful, I did well on panfish. On this picture-perfect day, I found an increased happiness at my Happy Place. 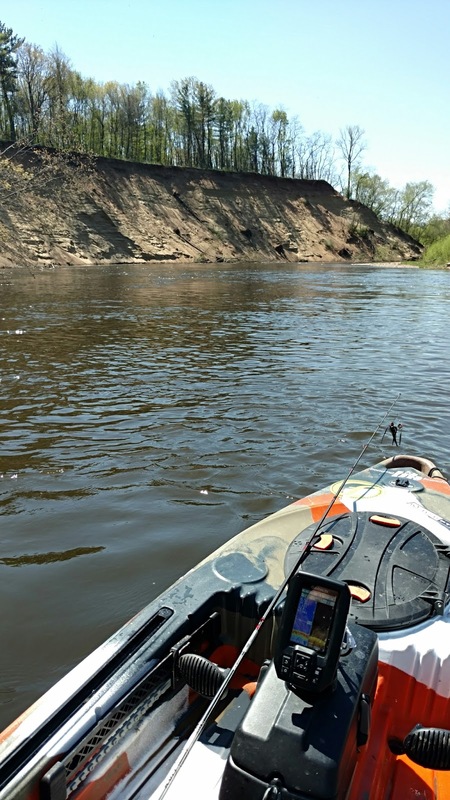 In past years, I fished these waters in my jon boat with a basic fish finder. 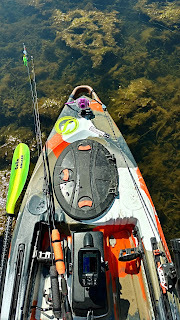 The stability, maneuverability, comfort, low-maintenance, and versatility of my FeelFree Lure powered by my Bending Branches Angler Pro paddle bring an increased level of Zen to my local reservoir. 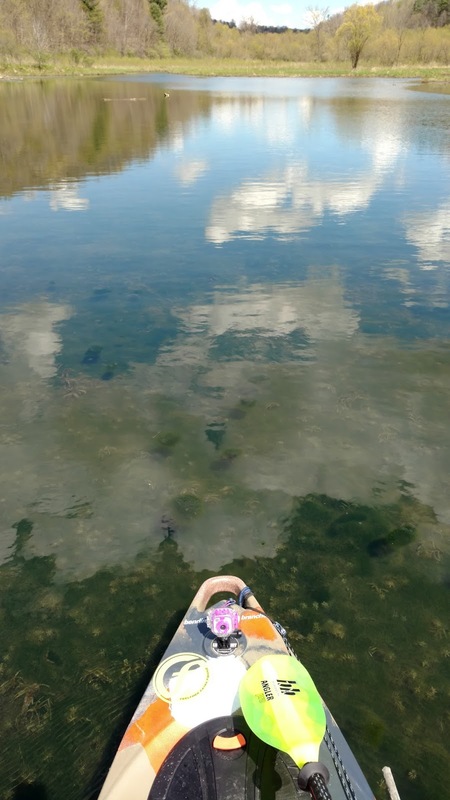 At the end of my trip, I took a paddle around the lake. My jaw dropped as I marked new way points on my Garmin. My previous, basic, fish finder never marked so many structures or fish. With proper equipment, my Happy Place is now my Happier Place. Please take a moment to enjoy the majesty of my Happy Place. Take a moment to identify your Happy Place. If you don't have one, think about it. Where would it be? It doesn't need to be a vacation, boat, vehicle, house, or something else that costs you tens of thousands of dollars. It can be a hike up a hill, a library book, or a movie. I would certainly enjoy my Happy Place on a fully-rigged bass boat. 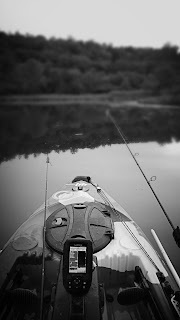 However, I find more enjoyment on a lower-cost, lower-maintenance fishing kayak. Find your Happy Place and visit often. Next to friends and family, it is my second-most important place to spend time. The stresses and problems can wait a few hours or days. Your sanity cannot.